In the world of technology, products that are fast, lightweight, and reliable are very much in-demand. Like in choosing software and web applications, more and more people prefer Firefox or Google for having these qualities. In computer operating system, there are few tiny and fast Linux distros with huge potential to succeed. The most popular among them is called Damn Small Linux. --No, I’m not cursing because that is its real name. Damn Small Linux is made in the USA by John Andrews and was first released on April 15, 2005. 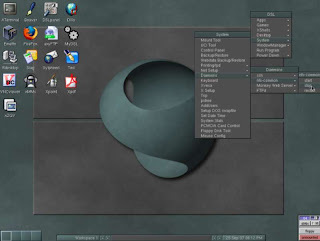 It is based on Knoppix and therefore has a Debian blood. Its primary goal is to provide a capable and easy to use desktop despite the size. Surprisingly, it is highly ranked at number 10 in Distrowatch, in fact higher than Knoppix and beating maybe hundreds of other much bigger-sized distributions. The download mirrors for DSL can be found here. Once the ISO image is loaded, you will have a choice to try several boot preferences. 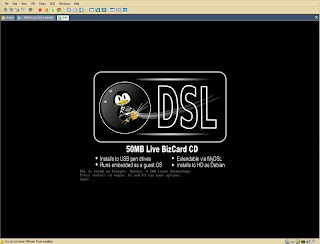 I tried the “dsl-tohd” option which will supposedly install DSL into my VM disk but didn’t. I already expected this to happen because at present, DSL developers are still working on improving hard drive installation. So I just booted DSL without a boot option parameter or in a normal way and was inside its Fluxbox desktop in a matter of seconds with USB, CDROM, audio and Ethernet working. 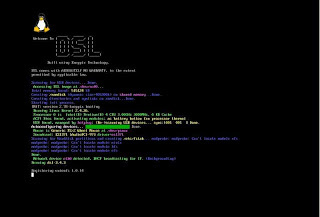 The Dillo browser will start opened by default which gave me the opportunity to read the DSL manual first. The application icons are well-arranged with just a click away to open a selected program. I always love its geeky FWM desktop but it may look funny or difficult to the eyes of some Windows or Mac users. Though it doesn’t have a sleek desktop like KDE or Gnome, its included themes and wallpapers are good enough and its responsiveness is exceptional even in the VMWare environment. DSL has crammed sufficient amount of pre-installed open source programs inside the live CD. It includes useful applications like MP3/MPEG player, FTP client, web browser, games, spreadsheet, word-processor, text-editor, .pdf reader, DHCP client, PPP, PPPoE, web server, and calculator just to name some. Plus, downloading and installing additional sofware is relatively easy using MyDSL Extension Tool with the help of Debian's Advanced Packaging Tool (APT) and Synaptic. For testing, I downloaded Abiword and it installed successfully without a snag. For a live CD, I would say that DSL is pretty stable and secure. My older version of DSL was very dependable so I would expect this new one to be even better. 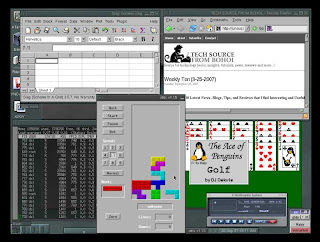 I tried running several of its applications like Tetris and Firefox and they were going smoothly and flawlessly like in a normal desktop that we are used to, and perhaps even faster at times. Damn Small Linux is a very handy tool every computer owner must have. Its reliable ability to allow you to rescue a broken system or serve as a Linux backup software, paired by its high portability made it so much valuable. All in all, it is a damn great distribution worthy to be applauded. Now I’m cursing with excitement. Another damn great review Jun. DSL can become an even greater distro if they can perfect the hard drive installation. I have found a way to hd-install it though as I am an experienced user. Installed synaptic but the debian repositories are very old ones. Tried some newer repositories but ended having all sorts of problems. I'm sorry, but let's be honest here. At this stage of development, it's still just a toy. It's very much more than just a toy. Also it's normal HD install methods (not really for virtual machines..) work fine and are in fact very easy to use. Nice review, very nice. I use debian linux on my main pc w/ fluxbox. I love DSL because it's so small, but until i see some decent upgrade's it'll just be a toy. I've loved it's speed, so i've modified by Debian installation to look, feel, and be as fast as the DSL environment. In all sanity; good tool/toy.